When former President Richard M. Nixon agreed to a series of TV interviews by British TV celebrity David Frost in 1977, each man had his own motives. 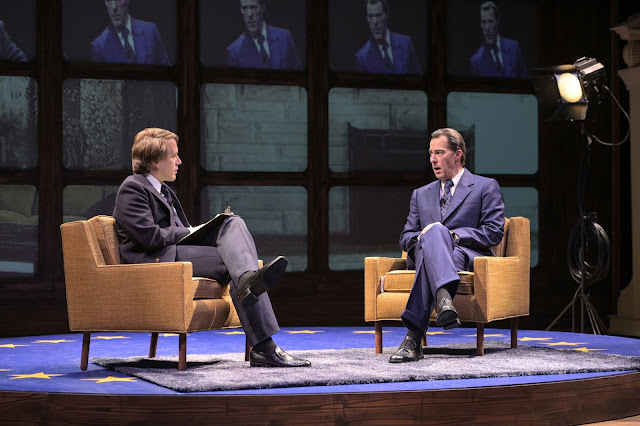 Playwright Peter Morgan delves into those motives in his timely “Frost/Nixon,” presented by TheatreWorks Silicon Valley. In the wake of the investigation into the Watergate scandal, Nixon (Allen McCullough) resigned on Aug. 9, 1974, rather than be impeached. He then returned to his home in San Clemente. Although reluctant at first, he was hoping the interviews would give him a chance to polish his image and stress the accomplishments of his presidency. For his part, Frost (Jeremy Webb) was hoping to revive his flagging career and show himself to be more than some lightweight entertainer. The play takes place between 1974 and 1977 and in several major cities. Each man had his own entourage. Nixon’s was led by his chief of staff, Col. “Jack” Brennan (Craig Marker). Frost enlisted reporters Robert Zelnick (Stephen Muterspaugh) and James Reston Jr. (Kenny Toll), along with his producer, John Birt (Adam Shonkwiler). From their point of view, the first interviews didn’t go well. Frost’s questions tended to be soft. Even when he tried to dig deeper into Nixon’s role in Watergate and thereafter, Nixon easily fended him off with long, self-serving responses that didn’t answer the questions. Finally, though, Reston dug deeper into the written records and discovered irrefutable evidence of Nixon’s wrongdoing. When confronted with the evidence, Nixon finally came clean and apologized to assuage his guilty conscience. All of this unwinds under the brilliant direction of Leslie Martinson, who guides her talented cast through impeccable performances. Steven B. Mannshardt and sound by Gregory Robinson. Running about an absorbing hour and 40 minutes with no intermission, “Frost/Nixon” will continue through Feb. 10 at the Mountain View Center for the Performing Arts, 500 Castro St., Mountain View. For tickets and information, call (650) 463-1960 or visit www.TheatreWorks.org.